If you feel like you’ve been there, done that when it comes to wine vacays, head to Portugal. There you’ll find wines made with indigenous grapes often not found anywhere else and vinified in interesting blends - including field blends - that offer incredible drinkability, food friendliness and value. In other words, you’re not going to constantly run into ho hum, played out chards or cabs. And contrary to what you might think, it’s not all about that fortified wine that travels down the river on boats. (But sure, you can find that too.) A new generation of winemakers is embracing modern technology while still retaining traditional methods like stone lagares, foot treating and fermenting in amphoras for an irresistible cuvée of a wine experience. The Alentejo in particular has seen an increase in amphora wine production, and all Portuguese regions are turning away from an overt oak influence. Producers are also frequently using lesser-known varietals and seeking freshness and elegance by planting grapes on higher altitudes and paying more attention to sun exposure and orientation and the effect of soil. Organic production is also trending. The best regions for wine tourism remain the Douro and Alentejo, which have the highest concentration of wineries. Lisboa surrounding Lisbon also produces some magnificent wines (DFJ Vinhos Segada White recently won double gold in the 2018 NY International Wine Competition, for example). Some wineries (quintas) offer accommodations, which can be super convenient if you want to indulge without worrying about driving afterwards. Reach out via the contact info on winery websites for more info. If they do not offer accommodations, stay in a city that’s close to a group of wineries to make day trips easier. The Pousadas de Portugal is a hotel organization that lists hotels housed in historical buildings for a more authentic sojourn. Even if you can’t book a room at a quinta, activities like harvest participation, vineyard picnics, hot air balloon rides, horseback riding and canoeing really immerse you in the culture. Summer is high season, and booking well in advance during that time is a must. Fall will give you a peek into the harvesting and wine-making process. This can be especially fun in the Douro, where you can see workers foot-treading grapes in traditional stone lagares and maybe even get to partake in the process yourself. ViniPortugal shared some info with us about Portugal’s main wine regions. Check a map, find your wine style and get planning. This quiet, laid-back area down south may just be Portugal’s most New World-like wine region. Producers here have embraced single varietals more than anywhere else (though wines are still generally bottled as blends), yet still retain the tradition of viniculture using talhas or amphoras. Topography gets more mountainous as you travel to the more northerly Portalegre sub-region, where wines tend to be fresher and more elegant. Recent Alentejo Winery of the Year in the 2018 NY International Wine Competition winner was Ribafreixo, which offers travelers a luxurious visit that includes in-house dining. Wine style: Full-bodied, fruity, jammy reds with high alcohol levels. Main varietals: Reds: Aragonez, Trincadeira, Alicante Bouschet; Whites: Antão Vaz , Roupeiro; as well as international varietals. Long synonymous with Port (that fortified wine mentioned earlier, in case you missed the reference), the Douro Valley is known for its steeply sloped vineyards, which are difficult to cultivate and just as tricky to navigate via car. (The Douro is the oldest regulated wine region in the world, dating back to 1756, as well as an UNESCO World Heritage Site.) Visitors will encounter three different ways of planting. Socalcos look like balconies supported by walls of schist (the most common soil type); patamares are larger and allow for mechanized viticulture; vineyards are also planted vertically on slopes. The last two decades has seen an increase in still wines made with indigenous varieties that are typically blended and can offer lots of value and drinkability for wine fans. Wine style: Intense, opaque reds with dark fruit notes. Main varietals: More than 50 grapes are planted in the Douro, including reds Touriga Nacional, Tinta Roriz, Touriga Franca, Tinta Barroca, Tinto Amarela and Sousão. Southwest of the Douro, the Dão is most unique because of its location surrounded by four chains of mountains, which protects it both from ocean winds as well as those of continental Europe. The region’s best wines show the effects of the balance of both. Soils are granite with some schist, and vineyard altitudes between 650 and 2000 feet keep the wines fresh and elegant. Wine style: Delicate, complex, elegant and full-bodied with great acidity and potential for aging. Main varietals: Reds: Touriga Nacional, Alfrocheiro, Tinta Roriz and Jaen; white: Encruzado. Until the beginning of the twenty-first century, all wines from this region (which surrounds the Dão) had to contain at least 75% Baga; today there is no minimum, giving producers much more flexibility in style. Flat in the west, it slowly rises to rolling hills in the east. Bubbly fans take note: Bairrada’s main claim to fame is that it produces 70% of Portugal’s sparkling wine. Wine style: Whites are citrus-driven, fruity and fresh, with a balanced alcohol content, high acidity, persistent finish and good ageability; reds are dark ruby in hue, with rich and complex aromas, concentrated tannins, decent acidity and ability to age. Main varietals: Reds: Baga and Touriga Nacional; Whites: Bical and Fernão Pires. 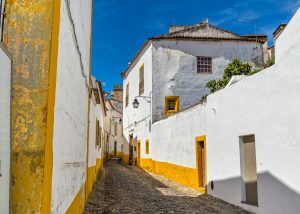 Known for its light-bodied, slightly effervescent, highly acidity and low ABV white wines, this region on Portugal’s northwest coast has an Atlantic climatic influence. This translates to lots of rain (that can contribute to vintage variations), fresh winds and milder temperatures. Most vineyards used to be trellises, but today rows and more sun exposure have helped improve the quality of wines in the region. More diverse wine styles have emerged in the past few years that show complexity, structure and better ability to age, and Alvarinho is increasing in importance. Wine style: Light and fresh, with high acidity, minerality and aromas of apple, lemon and flowers. Main varietals: Red: Vinhão; whites: Alvarinho, Trajadura, Arinto / Pedernã, Loureiro. For more Portuguese wines to explore, even without leaving your home turf, please click here.